Bill: While sending two, returning one may be an instance of capture two, recapture one, it has its own peculiar flavor relating to seki and superko. So I think it deserves its own page, linked from capture two, recapture one. The same goes for sending three, returning one. In a similar vein, a two-stage ko is an instance of ko, but deserves its own page. unkx80: Until you pointed out that there is a difference between the two, I did not realise there is one. May I ask whether the difference is that in sending two, returning one, the player whose two stones are captured must have deliberately played a self-atari move that caused the two stones to be captured? Bill: As I understand it, yes. In the English phrase, one player sends two stones, giving them to the opponent, and then the opponent returns one stone in exchange. 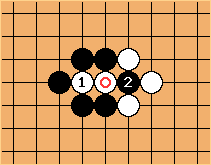 My sense of the Chinese phrase is that same player takes two stones and then returns one. Is that right? unkx80: Thanks. And yes, the Chinese phrase takes the meaning of the more general capture two, recapture one phrase. I'll fix this mess tomorrow, if not, the day after tomorrow.